This was to be the Friday Flotsam feature, wherein the Dividist takes a stroll down the metaphorical beach of the DWSUWF blog and takes note of the detritus that has washed ashore and cluttered his little island of rationality in the great big blogospheric ocean. Even though it is not Friday, we'll do it anyway. The beach is a mess. We are surrounded with the flotsam and jetsam of the midterm election cruise ship that sailed past a few weeks ago and is now little more than a dot on the horizon. Left behind - a variety of midterm topics the Dividist intended to blog about, but now serving as a distraction to the lame duck session, START treaty, foreign policy, tax cuts, the 2012 Presidential election season, and more looming memes. ITEM - Blog news and annoying blogger affectations. The Dividist has belatedly begun the process of cleaning up the sidebars, removing 2010 campaign contribution badges, and rearranging gadgets that were relevant to the midterms, but less interesting now. The Dividist is also working with some of the new Blogger templates, thinks the old blog is long overdue for a makeover, and will be looking to spruce the place up over the holidays. Stay tuned. Finally your loyal blogger noticed that he has been referring to himself in the third person with increasing frequency of late, using the Dividist® moniker he recently shelled out good money to register as a trademark. The Dividist finds this habit annoying on other blogs, and is unsure why he thinks The Reader would think any differently about this blog. The Dividist hopes this is just a phase he is going through and will drop the affectation soon. ITEM - Good Predictions, Bad Predictions and the end of the "100 Year Rule". The Dividist is in the habit of making election predictions, and 2010 was no exception. Days after the 2006 midterm restored divided government, he assessed his 2006 prognostications (more right than wrong), misquoted Ayn Rand, and looked forward to 2008. Similarly, after the divided government candidate lost the presidential election in 2008 he looked forward to 2010 and 2012 with fear, loathing and some more predictions. Time to face the music. Net net, although the Dividist predicted GOP pickups, he concluded there was no way for the GOP to restore divided government in 2010, thinking they simply were in too deep a hole to crawl out in one election cycle. Variations of that same prediction were repeated on this blog in the 10 in 10 series without much change until recently. These bad predictions were influenced by his fidelity to the "100 Year Rule" - as, up to 2010, it was a reliable historical precedent that the House never flipped party control unless the Senate flipped first or concurrently. It was a rule that had never been violated since the US began directly electing Senators almost 100 years ago. As they say, precedents are made to be broken and happily the Dividist was wrong. We now have divided government and a divided congress as a consequence of the GOP retaking majority control of the House. It's all good. The "100 year rule" will never be mentioned again. Another homily that is on the verge of being retired is "All Politics is Local". For the last three cycles, "All Politics is National" has been a better rule of thumb. In the future, I suggest The Reader pay more attention to the Dividist's co-blogger Tully's predictions. He has a better track record. He has already contacted me via e-mail, and I'm sure that he is good for it. But - in light of his other poor prognostications - the Dividist feels justified in crowing about this well documented winning wager. 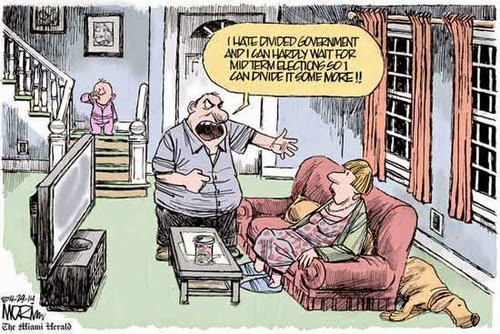 ITEM - Divided Government meme was a far more popular blog topic in the 2010 election than in '08 or '06. In each of the last three elections, there has been a spike in blog postings about divided government as election day approaches. This effect was magnified dramatically in 2010. The Dividist has used Nielson's BlogPulse trend search tool to measure blogospheric interest in each of the last three elections. This is a great little tool that returns a graph showing the percentage of all blog posts in the entire blogospheric universe mentioning any search term over time. In 2006, Divided Government posts peaked at .007% of all posts or 7 out of 100,000 posts on the peak day (NOTE - this is out of the universe of all blog posts, not just politics - including emo Japanese teen girl fashion diaries and pron blogs - just sayin... its a small percentage of a big universe). In 2008 divided government posts peaked at slightly less, or about .0065% (6.5 posts per 100,000) shortly before the election. Assuming the blogosphere is itself is expanding (I think a safe assumption), that would still indicate an absolute increase in blog posts on the subject, although slightly less as a relative percentage of all posts. In 2010 divided government posts peaked at around .014% or 14 posts per 100,000 - more than a doubling of blogging interest over the prior two cycles. Make of that what you will. ITEM - California is financially fracked, and the Democrats are now completely in charge. What could go wrong? The Dividist has been careful to only advocate a divided government voting heuristic at the federal level where there is substantial historical evidence and scholarship to support the rationale. The Dividist does not know if the same dynamic works at a state level. With a state as big as California and a bicameral legislature similar to the federal, he suspects it does. In any case, we are about to find out. With Ahnold in Sacramento, we had a quasi-Republican governor to balance the heavily Democratic legislature. No more. The Dividist is clearly out of step with a majority of his fellow Californians, who are perfectly content to have the Democrats run everything in Sacramento and to be represented in Washington by a Senator who is simply an embarrassment to the state. Jerry Brown is our Governor-elect. San Francisco Mayor Gavin Newsom is Lt. Governor-elect. The legislature is a blue as it ever was and the entire state government is now as blue as it gets. Despite being one the most highly taxed states in the union, the state is facing the biggest financial crisis in it's history, in no small part due to union featherbedding and pension deals cut for state workers who are - shock - big contributors to California Democrats. Brown promised in the campaign that there would be no new taxes unless approved by the voters. That is good, unless he was lying. What are the odds? Californians also passed propositions that prevent Sacramento from raiding local municipality revenues, prevents them from raising taxes unilaterally by calling them fees, but permits the budget to be passed on a majority (vs. 2/3 supermajority) vote. That pretty much only leaves big spending cuts to solve our financial problems and requires only a simple majority of Democrats to pass them. The California Democratic legislature now has the opportunity to fix the problems that their fiscal irresponsibility created. They have all the keys to power. There is no one else to blame. There are no excuses. Okay California Democrats - you created the problem- you own the problem - now fix the problem. ITEM - The Tea Party Giveth and Tea Party Taketh Away -or- Funny, you don't look libertarianish. The Dividist does not think anyone can deny that the energy and enthusiasm of the Tea Party movement was the fuel that drove Republican success in the House of Representatives. However, The Dividist also does not think anyone can deny that, given what happened in the House, the GOP underperformed in the Senate. Weak Tea Party supported candidates in Delaware, Colorado, and Nevada probably did cost the GOP control of the Senate. If the Senate finished 51-49, there was a reasonable possibility that Joe Lieberman and Ben Nelson could have flipped parties to give the GOP control of the Senate. At 53-47, that possibility is off the table. That said, the Dividist is very excited about the Tea Party supported Rand Paul win. For the first time, there will be a libertarianish voice in the Senate. The Dividist views Senator-elect Rand Paul in the same category as Senator Bernie Sanders. Sanders is a self described socialist, representing a small minority of the electorate, but the people of Vermont choose to give this ideology a voice in the Senate. The people of Kentucky have now given the libertarian-leaning a voice in the Senate, and for that the Dividist is grateful. 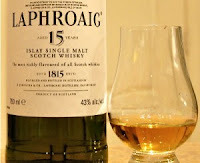 The Dividist is considering switching from single malt scotch to Kentucky bourbon in his honor. The left appears to be particularly unhappy about Paul, but they should not be. Rand Paul will be as much a thorn in the side of Republicans as Democrats. When it comes time to cut spending – Rand Paul will not hesitate to put Defense spending and our overextended and wildly expensive global military footprint on the table. 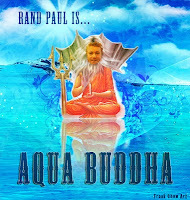 The Dividist may even convert to Aqua Buddhism. ITEM - Republicans are in position to take the Senate Majority in 2012. Unless they don't. It is hard to overstate how important the Delaware, Colorado, Washington, California and Nevada wins were for the Dems in 2010. The more seats they put in the bank this cycle, the better the chances of surviving likely 2012 losses. Although the odds are still against them, it is certainly conceivable that with an improved economy, some serious course corrections by the administration, and the possibility of even more help from the GOP (by nominating candidates as bad as Angle and O’Donnell) they can limit their net losses to 3 seats in 2012 and retain the Senate majority. Webb, McCaskill and Tester can still carry the day in 2012 by taking a consistent and strong fiscal conservative voting record into the election and showing independence from the Democratic leadership over the next two years. Representative Jason Altmire in Pennsylvania is a model for Democrats like these who want to be re-elected. He also arrived in Congress on the 2006 wave, winning in a Republican district. Since then he has won re-election twice more and survived the 2010 GOP wave. He did not vote for Obamacare or Cap & Trade, and never stops talking about restraining spending and fiscal responsibility. Let the Democratic Senators who have eyes to see and ears to hear, see, hear and understand. Amen. Another factor that is not getting as much attention, is the GOP can also lose 2-3 seats in 2012. It is axiomatic that in a wave election like 2010, the surging party retains all incumbent seats. There is no reason to believe that 2012 will be a wave election like 2010, which puts GOP seats also at risk. Certainly it is an open question whether Scott Brown can hold his seat in Massachusetts. It is also a realistic possibility the GOP/Tea Party will help out again by running more clowns in Republican primaries who will then lose against Democratic incumbents. There is already talk of primary challenges for Olympia Snowe and Orrin Hatch. Realistically, the numbers are stacked heavily against the Democrats, but the 2010 Senate Republican performance has opened the door a crack for the Democrats to squeeze through and retain the Senate in 2012. There are three ways that our brand spanking new divided government can continue past the 2012 election. The Democrats could retain the Senate majority. The Dividist considers this unlikely since 23 of the 33 seats up for reelection are held by Democrats, many of them swept in on the 2006 Democratic wave. Possible, but as noted above, they’ll be on defense and structurally have a much tougher row to hoe than in 2010. The Democrats could lose the Senate and retake the House. The Dividist thinks this is extremely unlikely, given the depth of the hole they have dug for themselves in the House. 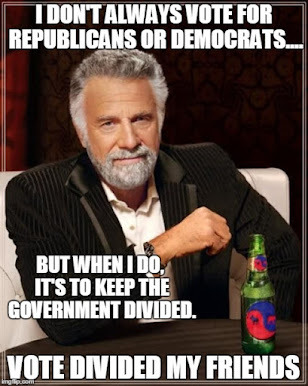 The last time the Dividist changed teams was after the Democrats swept Congress in 2006 and it became clear that the only way to keep the government divided was to elect a Republican President in 2008. It took the Dividist until December of the following year before he was confident enough in his forecast of the political winds for 2008 to prepare himself mentally and formalize the change. 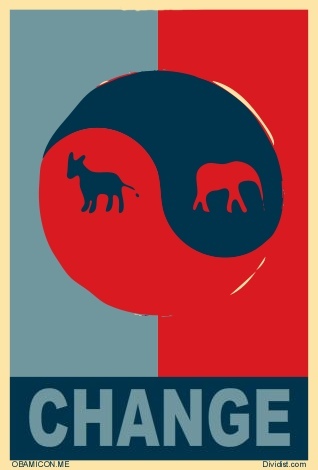 Changing teams in support of a political objective is, of course, incomprehensible to partisans who are psychologically incapable of voting for anyone outside of the their preferred party for President, Senate, or House of Representatives. Partisans generally subscribe to some variation of the “My party is on the side of angels and the other party is the spawn of satan.” school of politics. Their vote at the federal level votes is as predictable as sunrise and sunset and they represent the vast majority of the electorate. At least 70% of the electorate and probably closer to 80%+ vote as partisans, regardless of whether they choose to label themselves by their party of preference or as an independent. Political Scientists show conclusively that most self-identified "Independents" are closet partisan voters. Not that there is anything wrong with that. Some of the Dividist's best friends are partisans. He thinks the correct way to to think of Partisan Dead Weight (PDW) is as ballast - so long they stay roughly balanced on the right and left, they provide stability for our ship of state. It is because of them that a relative sliver of the electorate who are true independents, who will really swing their vote at a federal level between the major parties, can dramatically change the complexion and direction of our government. UPDATED: Fixed typos, added and repaired links. Tell that welsher Reynolds he still owes me a vintage Rocky Patel. 1990 was a very good year. I left myself some wiggle room. It took me 9-12 months after the Dems took over in '08 to finally get down to City Hall and register Rep.
We'll also need to see if Bloomberg decides to mount an Indy run. Despite his protestations, I've got a feeling he will. I'm not sure I understand our new primary law here in Ca after passing the open primary proposition. If it is still closed for Presidential primaries, the Rep primary will be more interesting then the Dem. I may have to keep my registration for that. In the meantime. I have to get used to watching MSNBC again. MSNBC? Wow. Better you than me. The CA prez primaries are still closed. IMHO an indy run by nanny Bloomberg would hurt the Dems. He'd have no chance of winning, but he sure do love spending his money to aggrandize himself. Hey, it stuttered, not me! Ballast is dead weight that still serves a useful purpose. Apt. At this point it looks to me like the most vulnerable seats in the Senate are both of the Nelsons, Conrad in ND, McCaskill in MO, and Tester in MT. But it's a long way to 2012 and as you said, much would depend on what kinds of idiots run against them. Those GOP seats aren't all exactly secure either. Especially Brown. But I wouldn't spend too much time assuming a Dem could win in Utah ... in some places cutting the incumbent loose doesn't even approach a party switch. I agree that Bloomberg has no chance to win as an Indy. I always hearken back to the fact that Teddy Roosevelt was a wildly popular ex-president, was more successful than anyone else in US history with a 3rd party POTUS run, yet still served only to function as a spoiler and elect Dem Woodrow Wilson. The only question is whether Bloomberg spoils it for the R's or D's, and I'll go the other way - I think a Bloomberg candidacy elects Obama. It would give the Independents with Obama-fatigue an alternative to voting for the GOP. Depending on who the GOP nominates, it would also give fiscal conservatives / social moderates a palatable alternative if the GOP primaries put hard line social conservative messages front and center. For the GOP to win the presidency, I think they would need to hold a similar Independent edge to what they enjoyed in the midterms. Bloomberg siphons that away. I've not figured out the Electoral College yet. I think this is the first 2012 Presidential Prediction in the blogosphere.